For the Known Occurrence, see The Griller. Grillers are Boss Salmonids that appear in Salmon Run in Splatoon 2 at special occasions. A Griller is a giant barbecue grill covered in armor with Salmonids inside, and moves along a path while ink falls beneath its slim body (similar to a Flooder). It chases after a randomly chosen player, designated by a laser pointer on its underside. The Griller will relentlessly pursue the player the tracking laser is pointed at. It is frequently accompanied by Smallfry swarms. In order to destroy a Griller, players must first hit its exposed tail back to stun it, then attack the spinning tails which appear while it is stunned. Anywhere else, and the armored vehicle takes no damage. A player will be instantly splatted upon running into its ink. A Griller is fast and can be unpredictable, so players have to be careful and wary of both the boss as well as its Smallfry escorts. Grillers only show up in certain special wave. If Mr. Grizz talks about Grillers in the dialogue box instead of Boss Salmonids, that means the players are in the special wave. This wave consists of only Grillers and groups of Smallfry. Grillers show up one at a time at the beginning, but later on in the wave they show up in pairs of two. 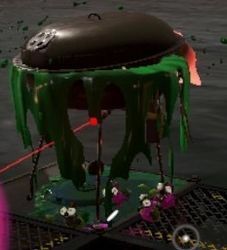 Mr. Grizz will warn the players when the Grillers start spawning in pairs. Armored vehicles called Grillers spawn one after another. Grillers lock their sights on to a target and will pursue it relentlessly. Smallfry are known for hitching a ride on the Griller and interfering with its targeting. Attack the weak spot on the back of the Griller to stun it. Stunning Grillers will reveal further weak points. Attacking these weak points is the key to taking down Grillers and getting Golden Eggs. Using a Sting Ray special, you can aim at the Griller and splat it without having to hit the tail. If the Griller has you in its sights, you're better off running away and letting your friends handle it. Operating costs for a single Griller would be enough to deploy 100 regular Salmonid fighters. A Griller has 2200 HP, and dealing 400 damage to its tail will stun it for 5 seconds. For reference, a Cohock has 400 HP. Objects resembling tomato, corn, cucumber or zucchini, and pink Chum-sized Salmonid can be seen inside the Griller when zoomed in. Grillers can only travel on flat surfaces or smooth ramps, and cannot move up or down ledges without making a detour. Grillers cannot land on a propeller platform (such as the lifts in Marooner's Bay and the horizontal platforms in Salmonid Smokeyard). If a targeted player enters a propeller platform, Grillers will either instantaneously target another active player not on said platform, or linger in place with laser sights off, not targeting anyone (if all active players are on a propeller platform). Steel Eels behave in a similar way. Grillers are very similar to Flooders from the Octarian army. They distinguish themselves from Flooders in two ways. Grillers can be destroyed while Flooders cannot, and you can ride on a Flooder but not on a Griller. Since a Griller cannot step on or off ledges like players do, the targeted player should maneuver around walls and ledges to manipulate its path and the direction it is facing, taking care not to lead the Griller in the path of other players, so that the rest of the crew can attack its tail. Players may stay on a propeller platform to get themselves off Grillers' sights in a pinch, such as to heal or to run out the clock. Doing so will cause Grillers to target the rest of the crew not on such platform immediately, putting them at risk. Smallfry have no problem following players on a propeller platform, so make sure to eliminate them. It is advised to activate the Sting Ray when two Grillers line up in front of the Sting Ray holder, as doing so will penetrate and stun both of them. Bomb Launcher can be used on a stunned Griller to damage it further. While staying on a wall when targeted may help the rest of the crew aim at its tail, beware that Smallfry may jump up and splat any player clinging on a wall for too long. On Ruins of Ark Polaris, Grillers can predict where crew members will land when they jump on the ride rails, and move to that position. While it is possible to avoid the Grillers using the ride rails, it is not recommended. The icon for the Griller used in SplatNet 2. Vegetables seen inside a Griller. Spinning Salmonids and vegetables seen inside a stunned Griller. Side view of a Sting Ray stunning two Grillers at once. Players using Inkjet and Sting Ray to stun each Griller. This page was last edited on 15 February 2019, at 23:52. This page has been accessed 33,650 times.